Image Size: 26.5" x 20"
Shortly after dawn, on a clear, cold New Year's Day, 1945, the German Luftwaffe had begun their last large operation of WWII, Unternehmen Bodenplatte (Operation Baseplate), a massive tactical strike against 16 Allied airfields in Holland, Belgium, and France which were in use by the 9th USAAF Tactical Air Forces and the British 2nd Tactical Air Forces. More than 900 Luftwaffe aircraft launched in the pre-dawn hours of January 1st under a successful cloak of secrecy and were able to catch their Allied enemies completely unaware, destroying in the first few hours about 200 Allied aircraft and damaging close to the same amount, nearly all of these on the ground. The unfortunate outcome for the Luftwaffe, however, was that in so doing, they lost over 250 of their own aircraft, and much worse, 213 pilots who would be impossible to replace at this late stage of the war. Symbolic of the outcome was the utter rout which took place at the American Army 9th Tactical Air Force airfield near Asch, Belgium, simply referred to by the Allies as Y-29. It was here where elements of the veteran Jagdgeschwader 11 were confronted by American fighter units which had either been on alert in warmed-up Mustangs of the 352nd Fighter Group, or already in the air, such as were some of the 366th Fighter Group's Thunderbolts. 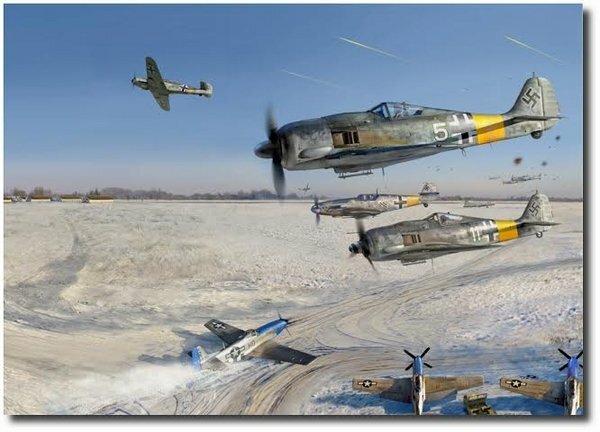 In the melee JG 11 lost 24 Fw 190s and Bf 109s, and only four of these pilots were captured, the rest killed, including JG 11 Kommodore Maj. Gunther Specht, a 34-aerial victory ace, who along with his wingman, Unteroffizier Sophus Schmidt remain MIA, their bodies have yet to be found. Pictured above, Fw 190A-8s of 9./JG 11 and Bf 109G-14s of II Gruppe/JG 11 pour across the airfield as elements of the 487th Fighter Squadron get underway, with 1st Lt. Al Rigby's P-51D in the lower foreground, taxiing the last few yards towards the active runway. After Bodenplatte the Luftwaffe would be unable to launch any other operation of similar magnitude in spite of the continuing high rate of fighter production instituted by Armaments Minister Albert Speer because of the resultant paucity of trained pilots, whereas the Allies were able to replace their losses almost immediately and any tactical advantages gained by the Luftwaffe's sacrifices on January 1st would evaporate within a few days.